204 pages | 2 B/W Illus. In recent decades, human rights have come to occupy an apparently unshakable position as a key and pervasive feature of contemporary global public culture. At the same time, human rights have become a central focus of research in the social sciences, embracing distinctive analytical and empirical agendas for the study of rights. 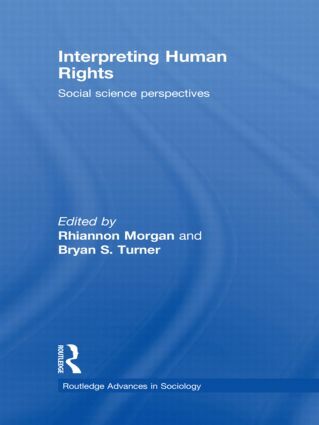 This volume gathers together original social-scientific research on human rights, and in doing so situates them in an open intellectual terrain, thereby responding to the complexity and scope of meanings, practices, and institutions associated with such rights. Chapters in the book examine diverse theoretical perspectives and examine such issues as the right to health, indigenous peoples' rights, cultural politics, the role of the United Nations, women and violence, the role of corporations and labour law. Written by leading scholars in the field and from a range of disciplines across the social sciences, this volume combines new empirical research with both established and innovative social theory. Rhiannon Morgan is Lecturer in Political Sociology at Oxford Brookes University. From 2004 to 2007 she was an ESRC Postdoctoral Fellow in the Department of Sociology at the University of Cambridge. Her publications include (2004) Advancing Indigenous Rights at the United Nations: Strategic Framing and its Impact on the Normative Development of International Law, Social and Legal Studies 13(4): 481-501 and (2007) On Political Institutions and Social Movement Dynamics: The Case of the United Nations and the Global Indigenous Movement, International Political Science Review 28 (3), 273-292. She is also author of Transforming Law and Institution: Indigenous Peoples, the United Nations, and Human Rights, with Ashgate (forthcoming 2009). Professor Bryan S. Turner is currently Alona Evans Distinguished Visiting Professor of Sociology at Wellesley College USA. He is the research leader of the cluster on religion and globalisation in ARI, and is currently writing a study of the sociology of religion for Cambridge University Press. He edited the Cambridge Dictionary of Sociology (2006) and Vulnerability and Human Rights with Penn State University Press (2006). Professor Turner is a research associate of GEMAS (Centre National de la Recherche Scientifique, Paris), an honorary professor of Deakin University, and an adjunct professor of Murdoch University Australia. Professor Turner is the founding editor of the journal Citizenship Studies and with John O’Neill co-founder of the Journal of Classical Sociology.